Food. We all love to eat and sometimes feel like we can’t get enough – definitely a love/hate relationship, no matter where in the United States you live. From afternoon munchies to greasy late-night cheese sticks, we crave sugary, salty treats – especially if we’re tired. Talk about the ultimate sleep horrible diet. Trouble is, while lack of sleep can cause cravings, it can also kill our sleep. 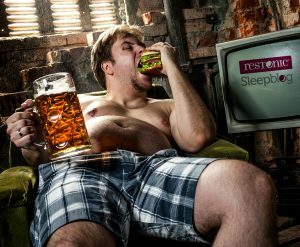 Do you wonder how your sleep suffers from binging on food at all hours? 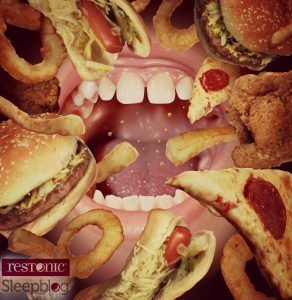 Does lack of sleep tempt you to reach for foods you know you shouldn’t have? Could where you live determine if you’re overweight, eating right or even getting enough rest? Check out the 3 fattest cities in the United States and how well their residents sleep, according to WalletHub. Memphis, TN – The homeland of Elvis, fried peanut butter sandwiches and BBQ, takes the throne for the fattest city. More than 30% of Memphis adults are considered obese and they have the highest number of “food deserts” (stores that don’t offer healthy or fresh food options). Memphis also ranks #2 for the sleepiest city. Shreveport, LA – The 3 rd largest city in Louisiana has loads more problems than being number 2 on this list. Shreveport also ranks in the 99th percentile of obesity, number 5 for diabetes and number 4 for high blood pressure, YIKES! Shreveport also ranks #20 for the sleepiest city. Houston, TX – As the famous saying goes, everything’s bigger in Texas. With more than 100 days a year with temperatures over 100 F, residents seem to be opting to stay inside with the AC and binge on snacks and Netflix. Not surprisingly, Houston has 1,034 fast food restaurants, the highest in the nation. Houston also ranks #25 for the sleepiest city. 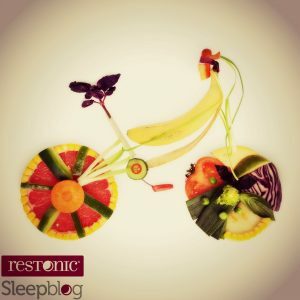 How do your food choices affect sleep? Eating and sleeping are two of the most basic human functions, essential to our survival. But sleep and food are more connected than you may realize. There are foods that promote sleep (potassium and greens) and foods that interfere with sleep (high-fat snacks – the ones you munch on before bed). What you eat affects your sleep and how much you sleep can affect how well you sleep. The 3 fittest American cities – and maybe the most well-rested too! transportation options and have easy access to parks and outdoor activities. 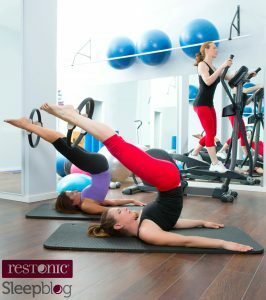 Check out the full list according to AmericanFitnessIndex. Ever notice how a good night’s sleep delivers the energy we need to get through our days and make the best decisions for ourselves and our health? Not clocking enough sleep, however, can easily put us at a disadvantage when trying to maintain healthy choices. And it’s a no-brainer that healthy food choices and regular exercise help us maintain a healthy weight.